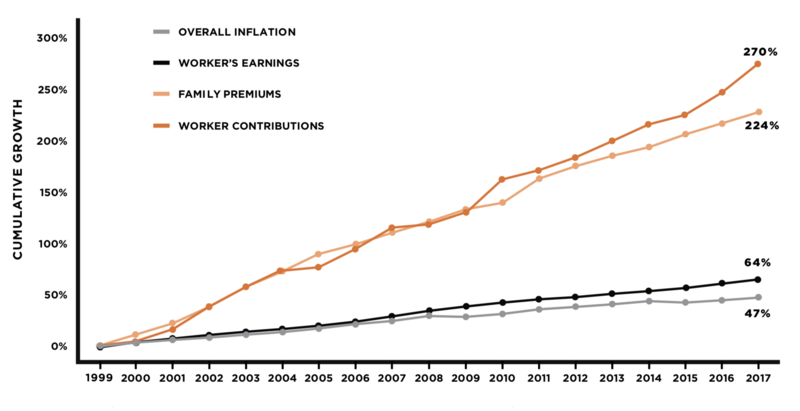 Over the last 18 years, the cost of family premiums and worker contributions have risen by a total of 270% and 224%, respectively. That compares to worker earnings growth of 64% and inflation of 47%. The result: every year health care is consumes a larger percentage of Americans' paychecks. 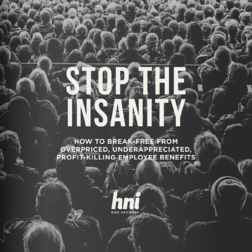 In 2007, the average employee contribution was $3,281. Ten years later, it's $5,714. Employer contributions have increased significantly over that time period as well, from $8,824 to $13,049. Millennials are spending a ton on health care. Perhaps the most alarming part, though, is that they don’t know they’re doing it. Much of their health care spend is made on their behalf, through payments that are invisible to them. If the cost of health care increases in line with conservative projections, $1.9 million of millennials’ $3.8 million lifetime earnings could go to health care. CHART 1 SOURCE: KAISER/HRET SURVEY OF EMPLOYER-SPONSORED HEALTH BENEFITS, 1999-2017. BUREAU OF LABOR STATISTICS, CONSUMER PRICE INDEX, U.S. CITY AVERAGE OF ANNUAL INFLATION (APRIL TO APRIL), 1999-2017. BUREAU OF LABOR STATISTICS, SEASONALLY ADJUSTED DATA FROM THE CURRENT EMPLOYMENT STATISTICS SURVEY, 1999-2017 (APRIL TO APRIL).